The Line #6 goes on the top at B1 level. 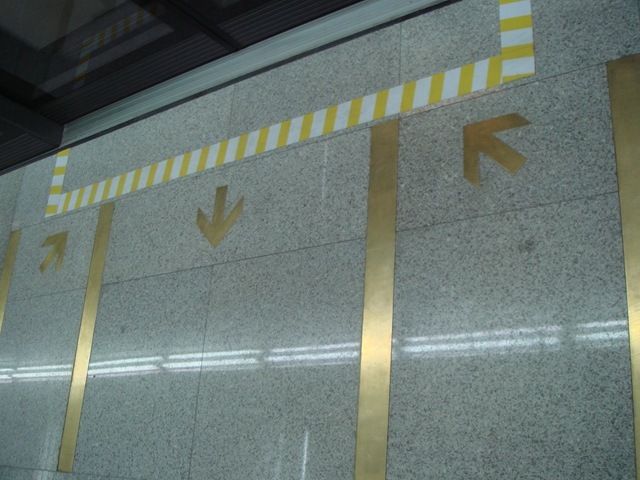 Line #2, and Line #4 go in the B2 level, cross the Line #6. Line #9 (partly opened on December 29, 2007) will run deeper on level B3. After one and half years, the station is finally ready, and I went there to send the first hand report to my readers. 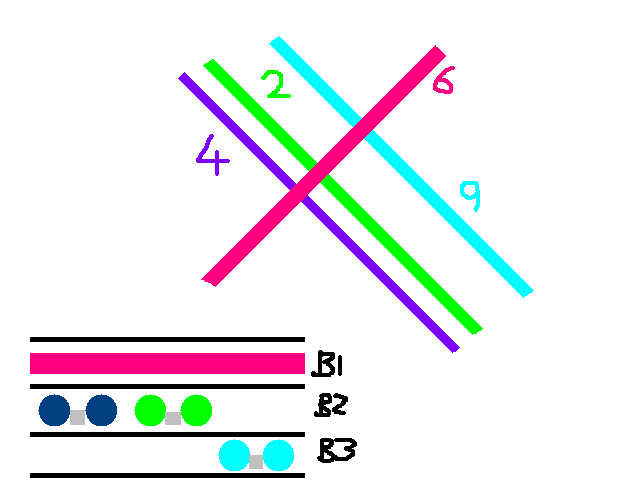 Below is a more professional diagram of Metro Line #6, #2, and #4. Below is the Line #6. 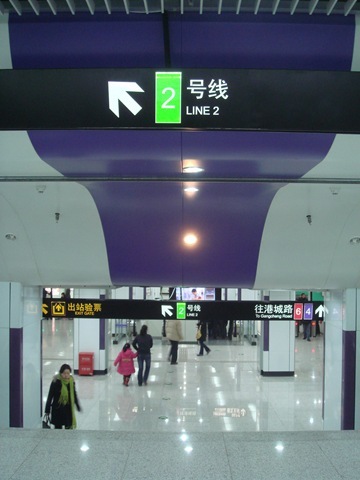 The train is running on the left, and on the right are three big hallway leading to 3 different lines. 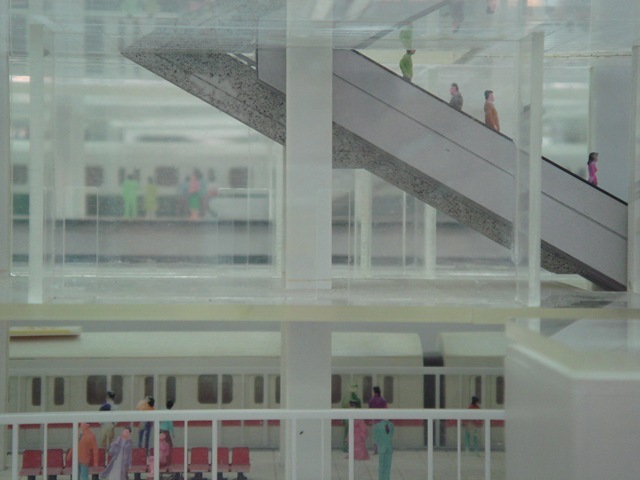 The photo on the left shows the glass gates, and on the right shows the hallways. On the right photo, you can only see one, but there are two other in the distance. This is how the hallway looks like looking from the glass doors. 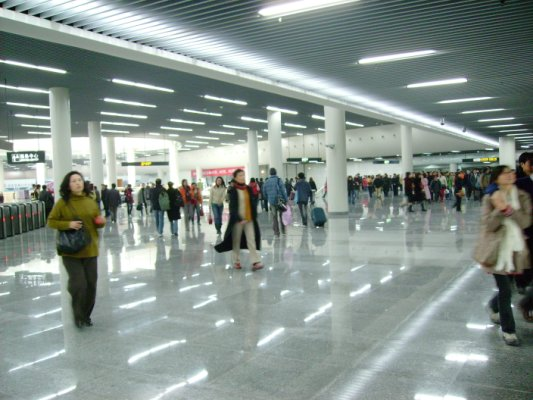 The two hallways leads to two different lines. 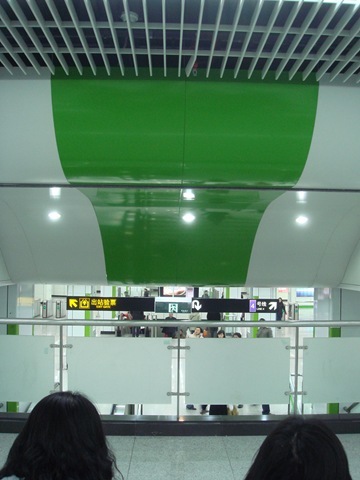 You may notice that the ceiling of the lines are painted the same color as the identification color of the corresponding lines. I love this design very much. The best design is the design that doesn’t require directions or signs. Above: the ceiling of the entrance. Below: the direction to the transition lines. It is pretty clear, isn’t it? 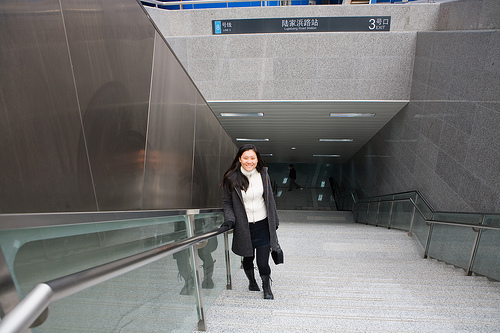 Just like the other tunnels, the third one leading to Metro Line #9 will open when the Line #9 is ready. 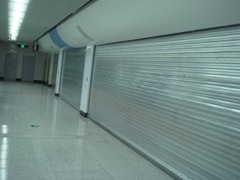 Now it is closed by some big rolling gates. Transition from Line #2, #4 to #6? Here is how it looks like for passengers who want to transit from #2, #4 to #6. 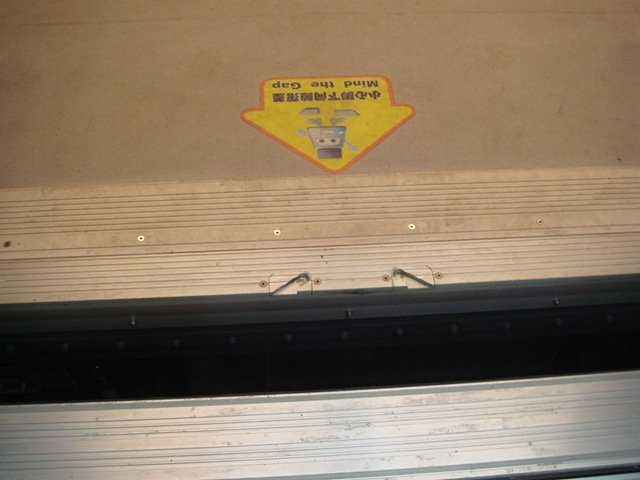 Below is the photo taken from the end of the elevator. 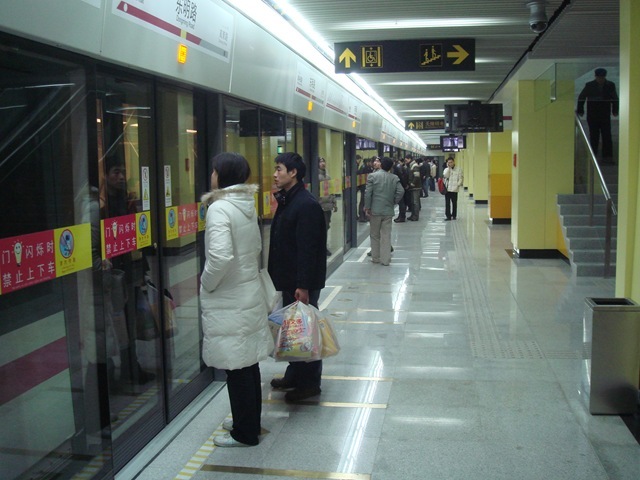 On this photo, you can see the platforms of both Line #2 and Line #6. The top rail is for #6, and the below rail is for #2. Getting up to B1 using the elevator, and you are only about 10 steps away from the line #6. Pretty efficient. Metro Line #6 Century Avenue Station is maybe the only underground Metro Station that have platforms for the two direction arranged on different side of the rail. All the other underground stations put the platform in the middle and two railways on the opposite sides. 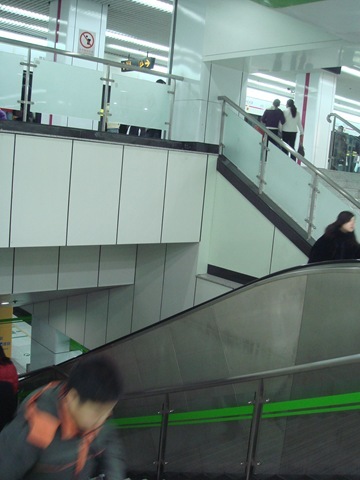 This brings some challenge for passengers – if they arrived at the wrong side, they have to get back to the platform of either line #2, or line #4, and the get to the Line #6 using the elevators and stairs on the other side. 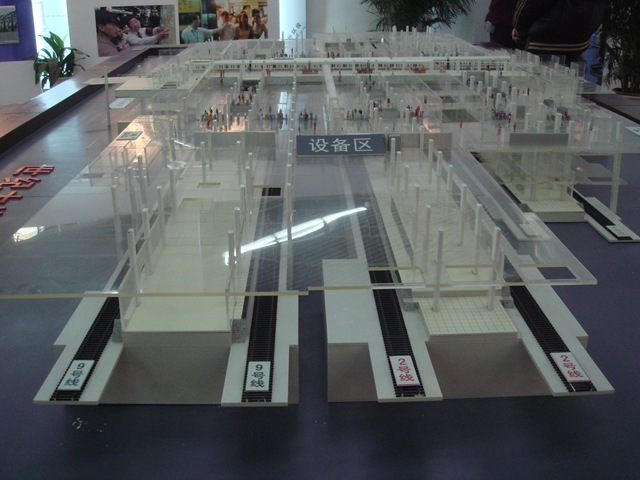 In People’s Square Station, I found out a model of the Century Avenue Station. 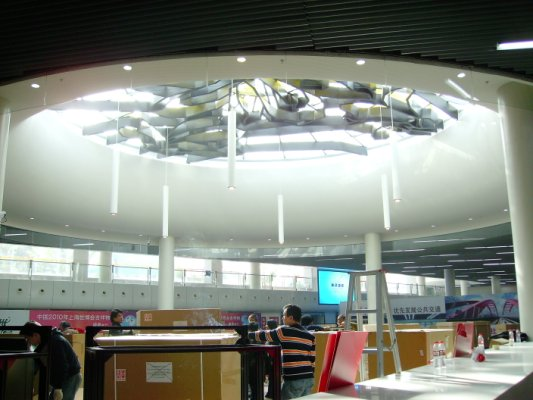 In terms of convenience of transition and clarify of the design, this is the best designed stations in Shanghai. Compared to the "short transition path" and the "long transition path", this is a very big improvement. 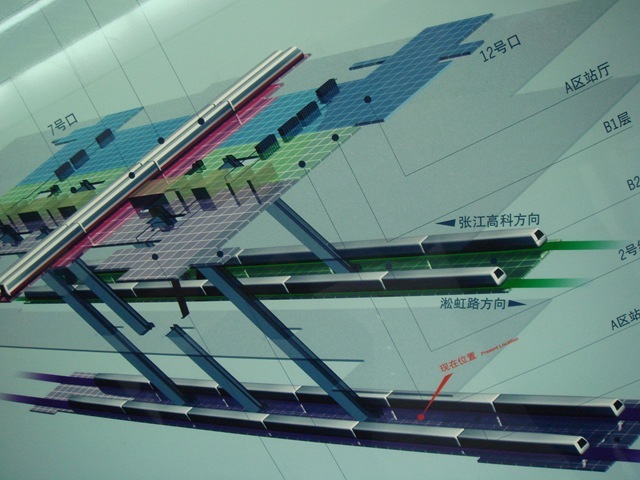 This station will also be the largest transition station (4 lines) in near future. Welcome to this brand new station! 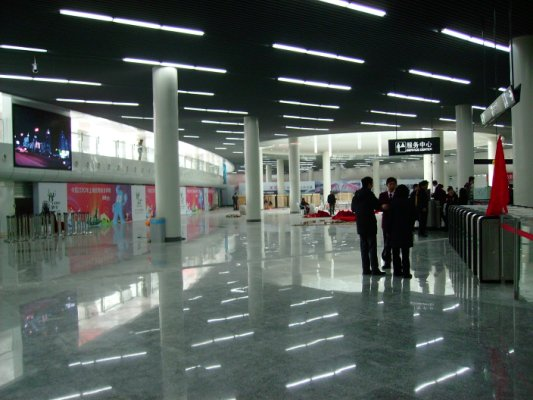 Congratulations to the newly opened Shanghai Metro Line #6. I hope this series of post covers most of the Metro Line #6. I love this line! 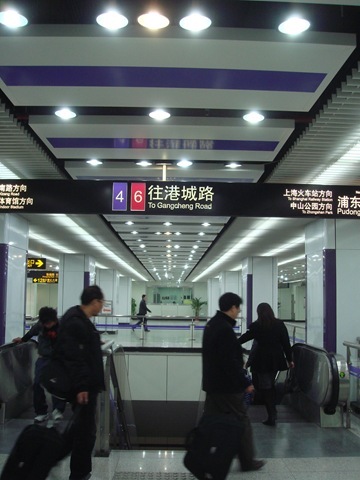 Shanghai Metro Line #6 is the only line in the Metro system that completely runs in Pudong. 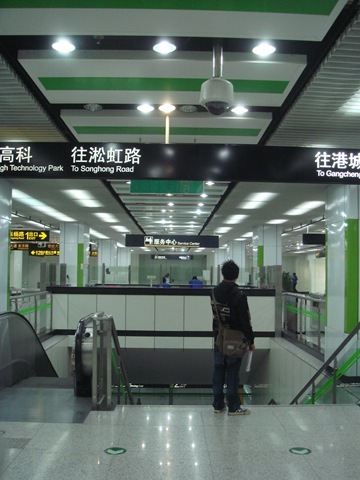 It starts from the northmost Gangcheng Road Station, and arrives at Jiyang Road Station on the south. 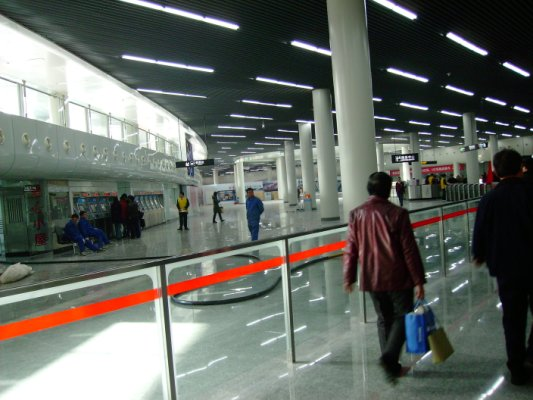 The whole line runs in Pudong. 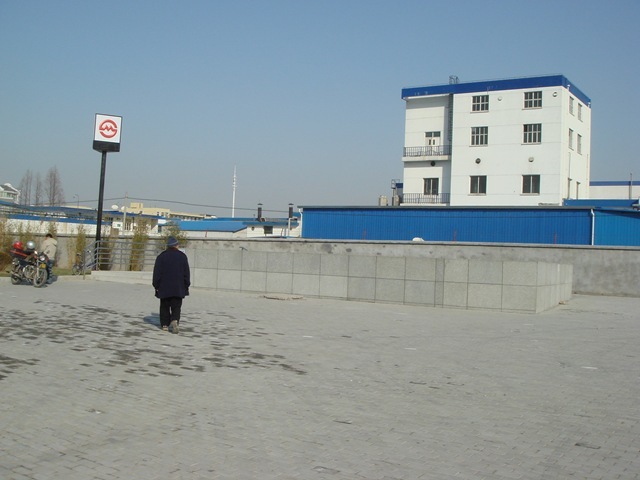 There is a portion of 0.25 km that connects the underground lines and the ground lines. It is almost under-ground but don’t have a cover. 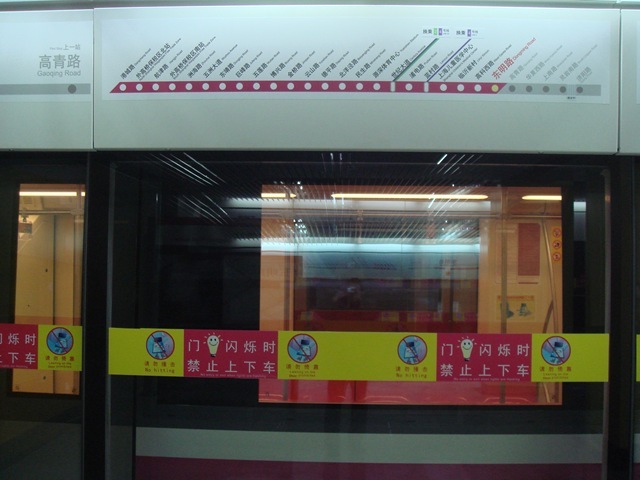 The Metro Line #6 is marked with color pink (as shown at the top). All the seats, signs, and decoration are pink. I even want to call it "Hello Kitty Line". It has 28 stations. 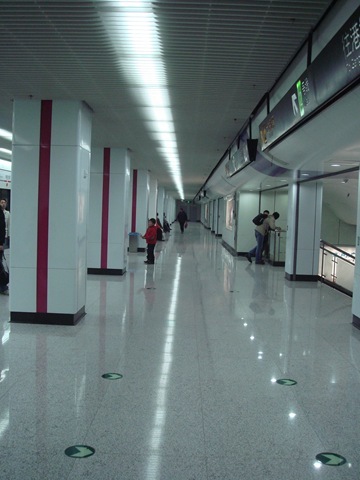 19 stations are underground, and 9 stations are above ground. 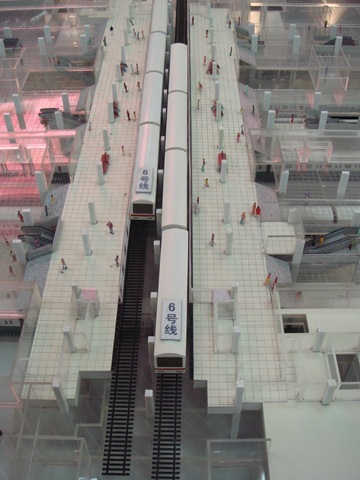 All the platforms are 80 meters in length, and hold 4 train carts. 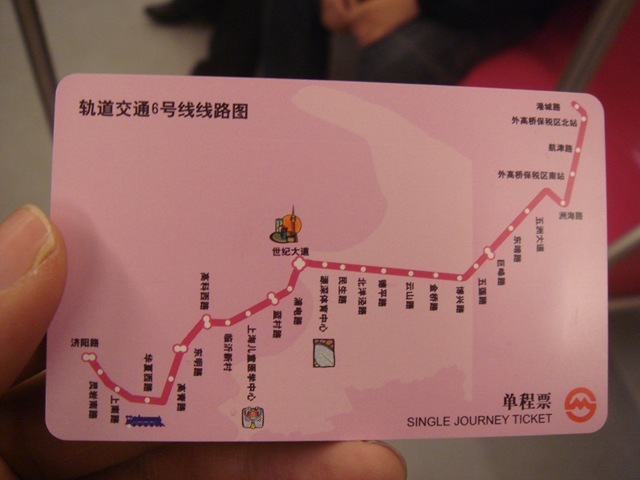 Explorer Shanghai has a great map illustrate the stations of Shanghai Line 6. Dongming Rd. Station is a typical "far" station from the downtown. Look at this: if there were no metro sign on the top of the pole, it is hard to believe there is a station entrance behind the man. For the chicken and egg question, I believe for Dongming Rd. 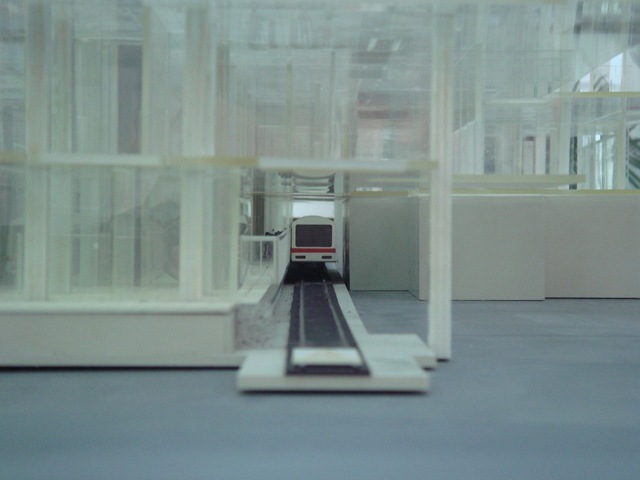 Station, it must be "Metro Station first, then development". Look for this sign to locate Metro Line #6. Most of the lines leverages ticket vendor machines. 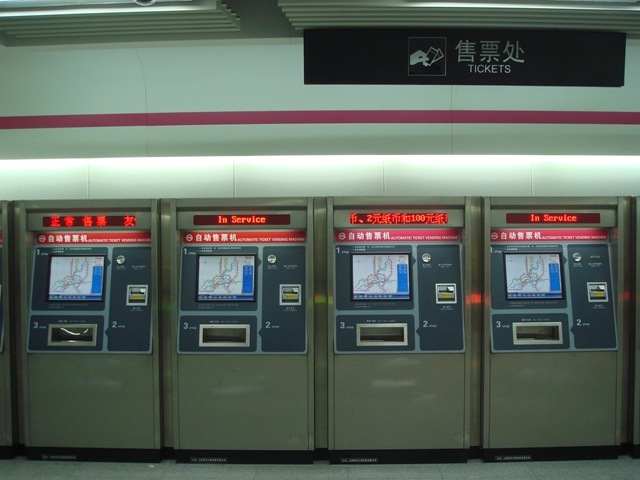 Below are the machine at the Metro Line #6 Dongming Rd. Station. 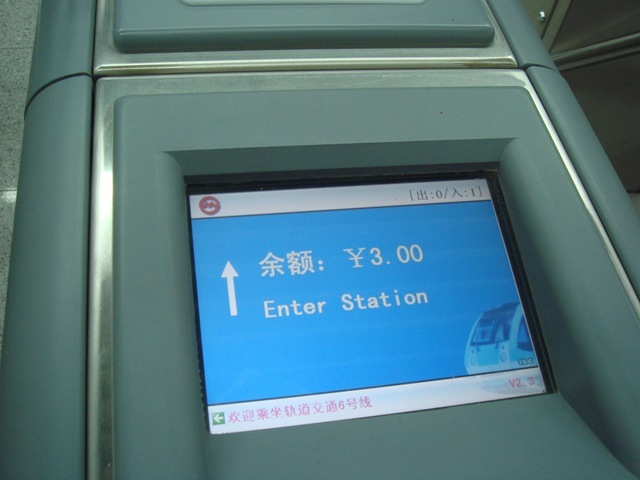 Below: The screen of ticket vendor machine. You can choose a destination station, and it will show you the money needed. I bought an additional ticket just to keep it with me. I believe in the future, it will be hard to find a ticket like this – I mean after 10 years. 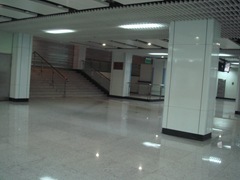 Below: The entrance of the station. 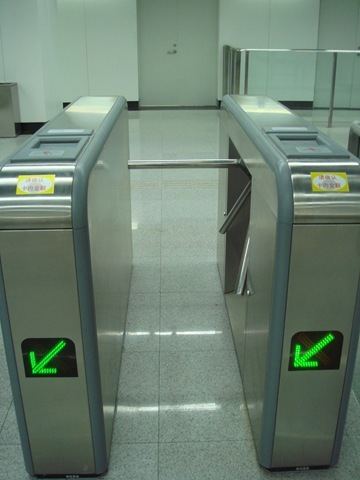 There are some improvement over the current gate used in Metro Line #1 and #2: It is using arrow to point you which side of the gate you should enter. This is very handy since many people get confused on Metro Line #1 and #2 about which side of the gate they should enter after they place their card on the island. After swipe your card, the money in the card (remaining amount) is shown on the LED screen. 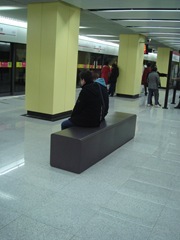 This is the platform of Metro Line #6 Dongming Rd. Station. The train is approaching. 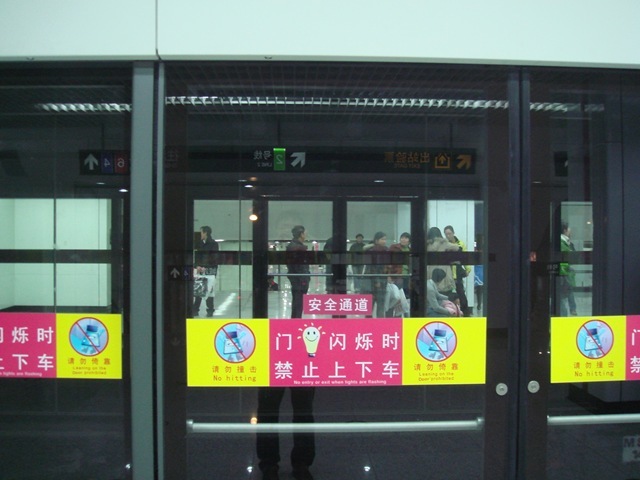 The newly built metro lines are all equipped with glass doors – for safety reason and to save energy for air condition. Look for the pink lines. It is everywhere along the line. 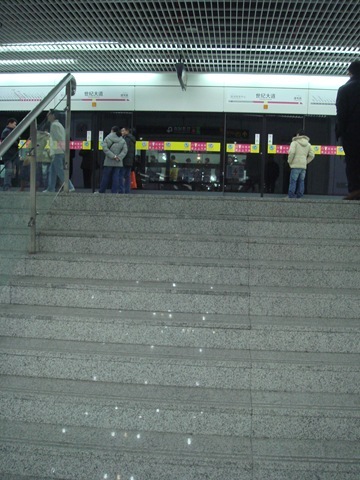 It also have signs to denote where you should stand when wait for the train. 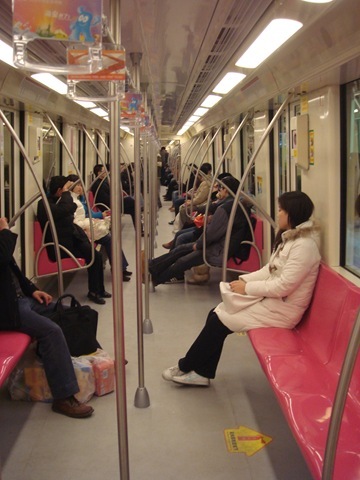 The problem is, unlike Metro Line #1 and #2, passengers still need time to get used to Metro. When I took my first ride, there are people rushing into the cart from all direction, and completely block the way for people getting out. The station is pretty of minimalism. The seats are very simple. 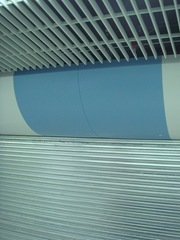 There is a technical problem for the platform – there is about 10 cm gap between the cart and the platform. The train is higher than the platform. This can be a big problem, and I don’t know whether they can fix it. The good thing is, they have a lovely sticker to caution people about it. Here comes the "Hello Kitty Line"! 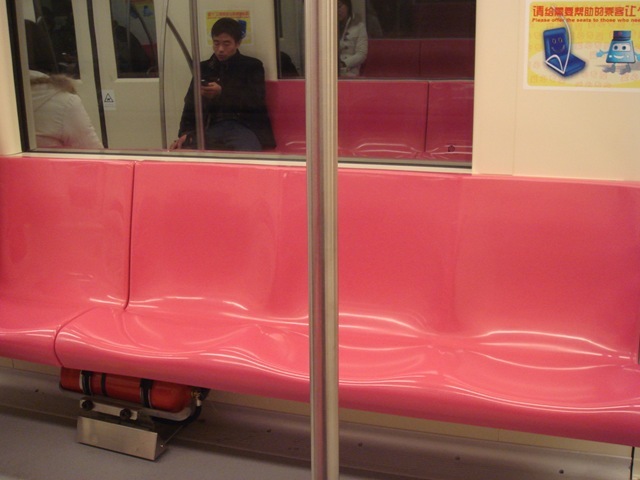 The seats are pink. Wendy loves the train a lot. Me? Hmm…. Do they have other color to pick other than pink? 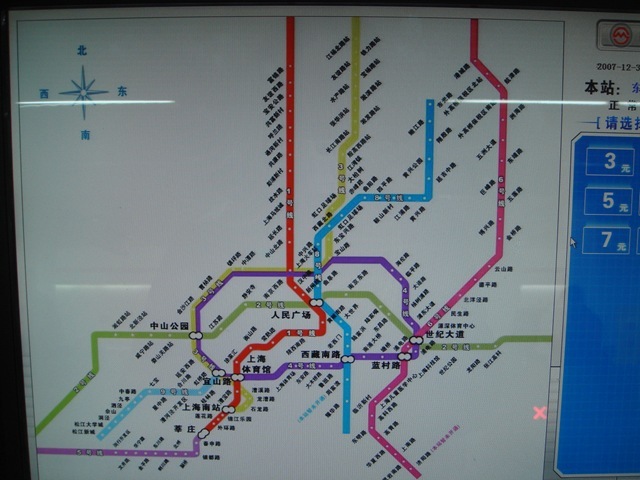 I understand it is hard to find out 18 distinct colors to mark the 18 future metro lines in Shanghai. This one: when there are more people in the train. is is a big improvement, please be aware that they don’t provide toilet paper, and there is no vendor machine… If you are in a hurry, and do need some, well, try your luck to see if you can get some newspaper…. :-( Hope someone can fix this in the future. 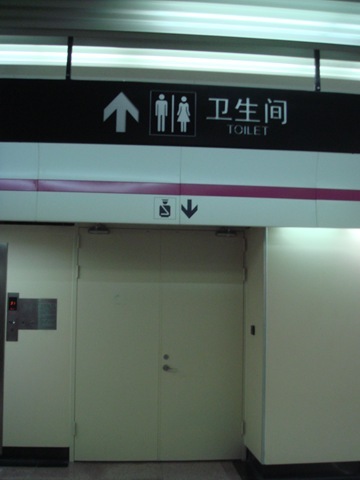 Anyway, big improvement already since there were not fixed toilets in any other stations before. 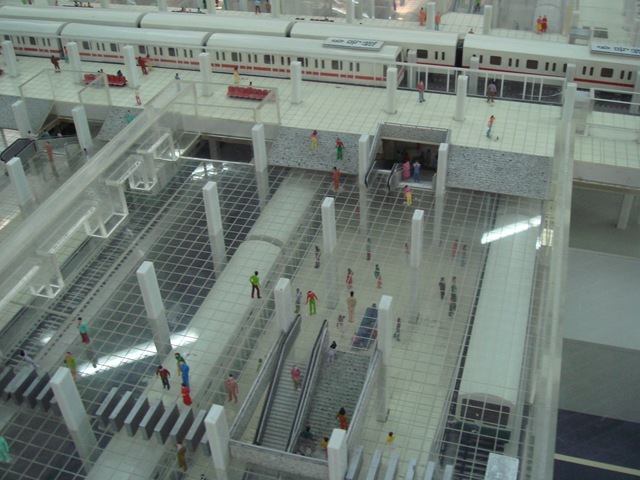 With Metro Line #6, you can easily transit to Metro Line #2, Metro Line #4 at Century Avenue Station, and Metro Line #4 at Lancun Rd. Station. I have the following two articles to particularly introduce these two transitions. Wendy just took Line #6 at rush hour (6:30 PM). 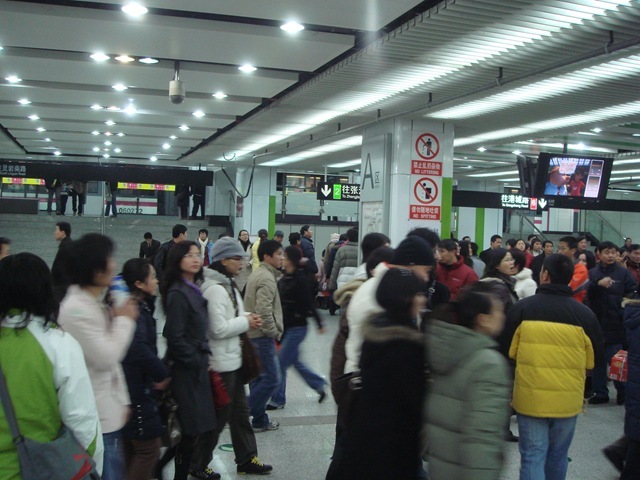 She reports that it is too crowded – extremely crowded. The safe guard is pushing people into the cart, and there are still many people waiting outside. The current interval of 15 minutes does not serve the demand well. 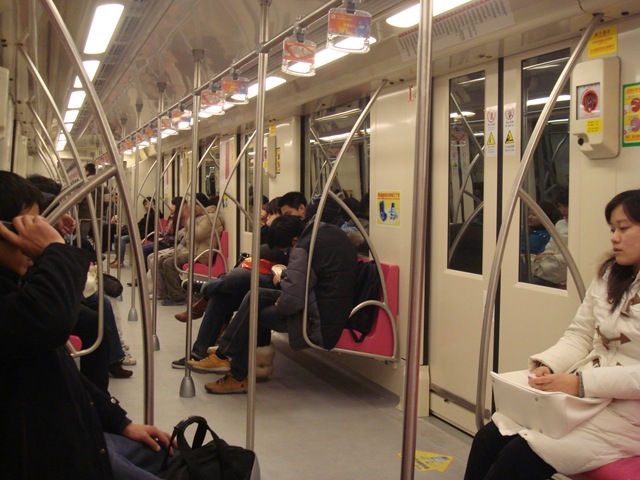 If the first working day of Line #6 turned out to be so crowded, how about the future. 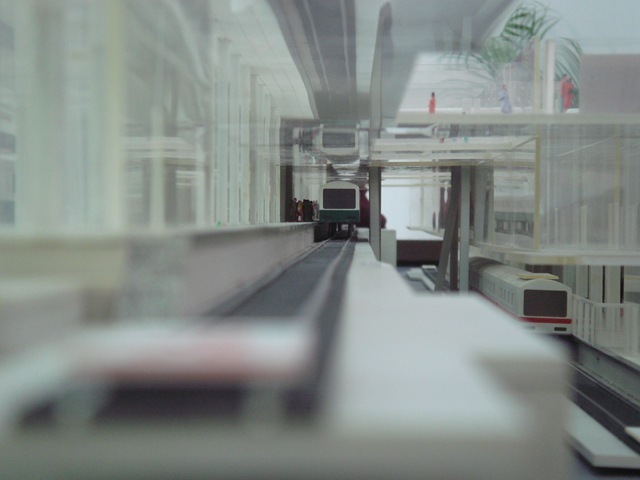 On the other hand, it proves that to build Line #6 is a good decision, a clear contract with Maglev. 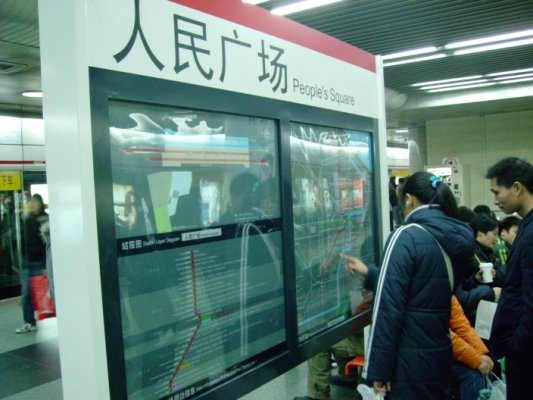 On TV, and forums, passengers are complaining about the adjustment of the bus lines around Metro Line #6. 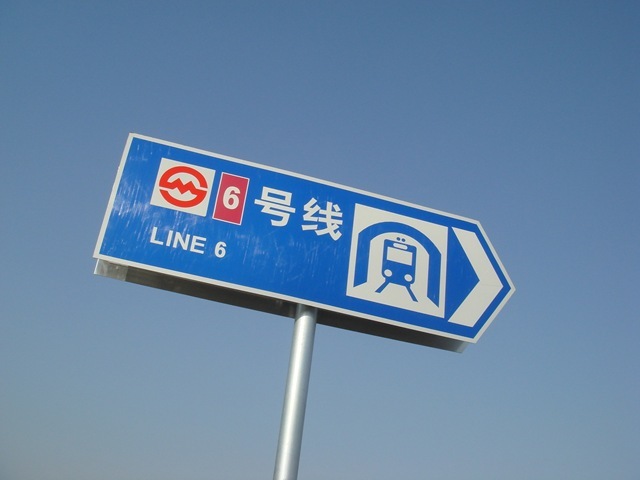 According to the previous forecast, Metro Line #6 will take the major roles of transportation for Pudong. So many bus lines were canceled at the same time when the Metro Line #6 opens. The reality is, it is too crowded for people to get onto line #6, while there are no buses available. I wish the problems like this will be solved very soon. 6 Good luck, my Hello Kitty Line. 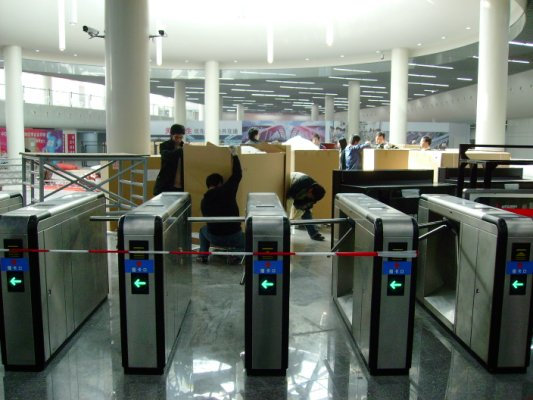 Dec 29 is a big day for Shanghai Metro. 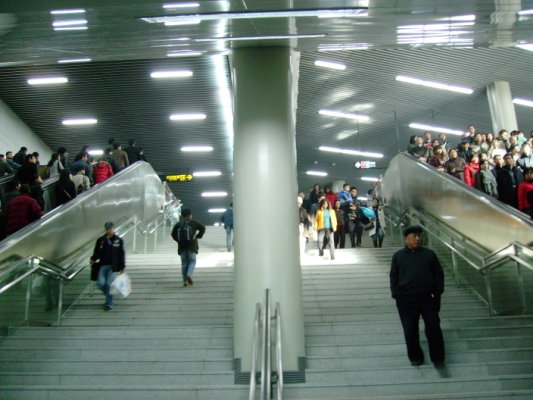 58 New Metro Stations were put into operation on the same day. Yes. It is not a typo. It IS 58 stations. This afternoon, I prepared my camera and coat and wanted to take photos of the new Metro Stations and metro trains, but it was really too cold and windy today. So I decided to turn to flickr to find some photos, and then do a report with these photos. 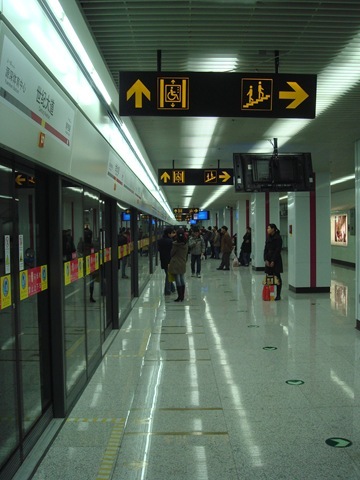 Here is a post about the opening of Line 8 near his/her home. 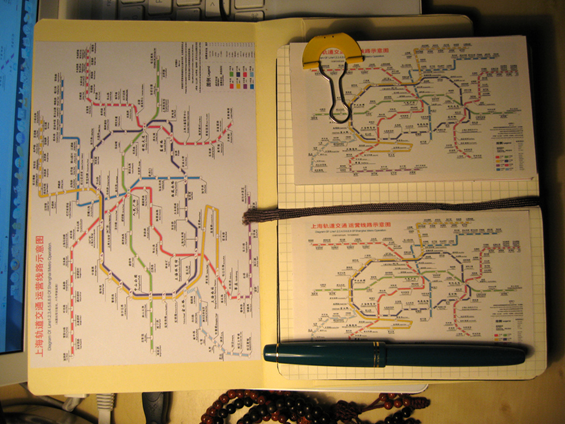 I am expecting my Metro Trip in the next few days. 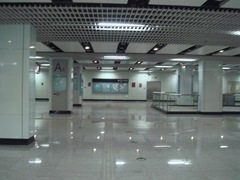 I will take more pictures of the Transition Hall of People’s Square Station, the new Line 6, and the Line 4. I prefer to use my own photos in my blog, and I try to avoid to write about something without being there myself. 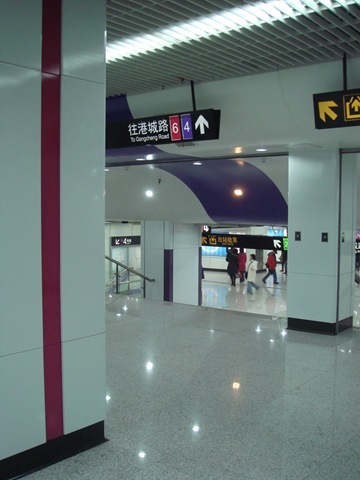 Shanghai Metro is an exception since it is so important to be missed. I will take more photos next time I take a ride.